Faqir Mohammed. Image courtesy of AfPax Insider. 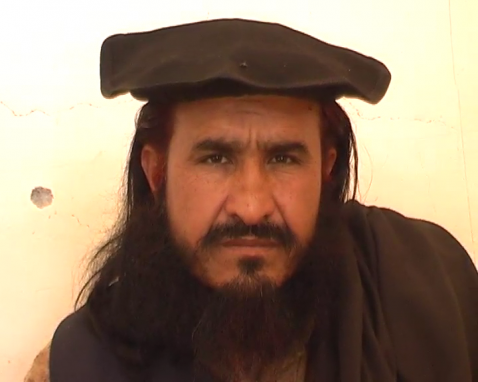 Faqir Mohammed, the former emir in Bajaur of the Movement of the Taliban in Pakistan, has returned to the fold after his dismissal a year ago for conducting negotiations with the Pakistani government. Faqir is close to al Qaeda emir Ayman al Zawahiri. Faqir recently appeared on a videotape with Maulvi Abu Bakr, the new emir for the Taliban in the Pakistani tribal agency of Bajaur, along with four commanders identified as “Brother Ahmad,” Sheikh Osama, Maulana Abdullah, and Qari Zahid. The videotape, which was produced by the Taliban’s Umar Studio sometime in December 2012, was released on the Jamia Hafsa Urdu Forum, a pro-al Qaeda and Taliban website, on Jan. 22. A translation of the videotape was obtained by The Long War Journal. The video begins with an unidentified interviewer asking Faqir if the “minor differences among the mujahideen in the tribal area of Bajaur Agency” have been resolved, and if Abu Bakr is indeed the new Taliban leader for the agency. Faqir confirmed that Abu Bakr is the new emir for Bajaur. Abu Bakr replaced Mullah Dadullah, who was killed in a US airstrike in the eastern Afghan province of Kunar in August 2012. Dadullah took over the Taliban in Bajaur after a long-running dispute with Faqir led to the latter’s dismissal in March 2012. Faqir was accused of both not fighting hard enough against Pakistani forces and negotiating with the government without approval from the top leadership. In addition, Abu Bakr affirmed that the Movement of the Taliban in Pakistan seeks to wage jihad and establish a caliphate by force, which is a goal of al Qaeda. “We will continue fighting until we achieve our current objectives of Sharia, caliphate, jihad, honor and our sacrifices …” he said. He also indicated that there are foreign fighters in the ranks, but was not specific. Faqir’s abrupt dismissal last spring was considered by some analysts to indicate a major division within the Taliban ranks. Some local Taliban leaders in Bajaur were unhappy that Faqir had been fired, and warned it might lead to infighting. Ihsanullah Ihsan, the Taliban’s top spokesman, announced Faqir’s dismissal in an offhand manner in March 2012. Faqir led the Taliban in Bajaur for years, and he is also tied to some of al Qaeda’s top leaders, including the group’s emir, Ayman al Zawahiri. In the past, Faqir sheltered Ayman al Zawahiri and other senior al Qaeda leaders; one of the first US drone strikes in Pakistan targeted Zawahiri and other top commanders in an area controlled by Faqir. Additionally, the videotape shows that the Movement of the Taliban in Pakistan is far from defeated, disorganized, and rife with leadership disputes, as the Pakistani government has claimed. Hakeemullah and Fazlullah were able to convene the Taliban’s shura, send a delegation to Bajaur to mediate the dispute, and organize the reconciliation of the Taliban factions in the tribal agencies.